Sadness, as the title suggests, is in this installation oddly averted, but then the work is also about its absence. If sadness is avoided here, then that also impacts the expressivity of the installation: the objects retain, in spite of a formal clarity, even beauty, an unusual inaccessibility- it is left to the viewer to tie together the central themes and the lines of connection between them. 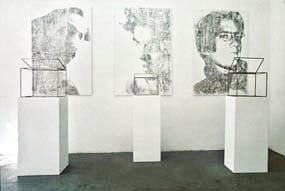 Fixed in the center of the room, discomfortingly and as if needlessly integrated in the installation, the position of the observer becomes another point in the communication-less frame of reference between the three portraits, the three metal box frames and the three off-kilter curtains. Objects, that appear to be the same distance apart from one another, as the viewer is to them. They don't stand for themselves at all and are even defined ad absurdum by their practical use value. Barely recognizable the three faces on the left, barely visible the slow hard look, that, like behind a veil into the void, befalls the viewer: a concealed or a swept away gaze. Only suggestively do the metal frames enclose a box, an inner form that presents itself at the same time as see-through and defenseless. Neither secretly covered-up nor filled, the boxes are instead purposelessly empty, the half open top redundant. 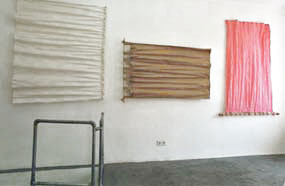 Upside down are the common drapes, but also shifted and turned to the side they remain pulled together, closed, no view to the outside is possible. Is this a protection or autism? And the viewer, whose position is integrated into the spellbound and senseless nature of the objects, who occupies the middle of the room, first perceives the space and recognizes, that outside and inside simultaneously offset, even inhibit one another. Thus even the construction of a border line, that invisibly precedes all the permutations, all the implied locations, remains unrecognizable in the installation, impossible. The viewer is at the same time always outside and inside- he is outside the boxes, whose own interior appears in turn to be facing outward. He is watched from above, but the three faces show themselves to be introverted, absent-everything representative about them worn away-and they deny the gaze of the beholder. If one turns to the left, one feels again on the inside: but behind the curtains there is no outside from which to seal oneself off, only a wall in front of which we are standing. Everything in this installation is invisible wall, there is no over there, there is no possibility for entry, there is only emptiness, redundancy, and beauty. There is no possibility for sadness, or perhaps only where the artist himself offers a word: in his title, that sets the theme and at the same time establishes the line of separation and, that in so naming, makes a claim for the presence of sadness.